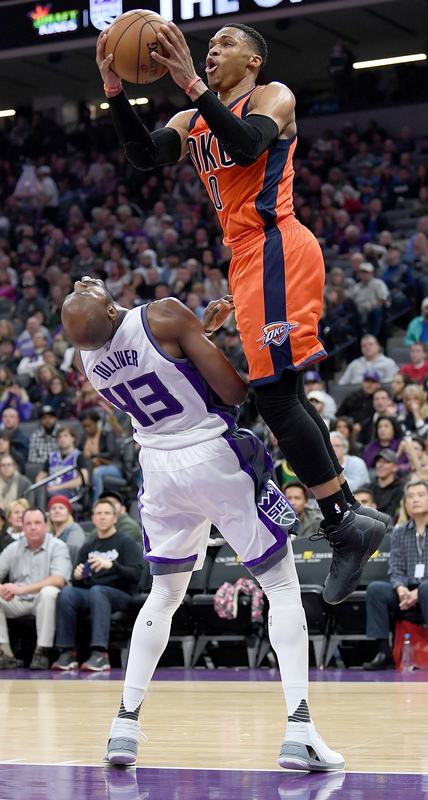 The Kings’ Anthony Tolliver is the master of the charge. But there is something else that could distinguish Tolliver: a stat that could unveil the undrafted journeyman’s best skill. The only problem is that it hasn’t been invented yet. The fuel of this stat: collisions, particularly when a ballhandler is barreling his way toward the basket despite a defender standing in his way. If those collisions make their way into the stat sheet, they usually go one of two ways: a charge call on the offender or a blocking foul on the defender. Players such as DeMarcus Cousins, Ersan Ilyasova and Marreese Speights have dominated the leaderboard of charges drawn in years past — and this year — according to NBA Miner, an advanced stat site that has tracked charge numbers for several seasons. But shouldn’t we be interested in more than just how many charges a player draws? The raw number doesn’t tell the whole story because it’s not speaking to a player’s success rate. If a defender draws a ton of charges, but gets whistled for nearly as many blocking calls, then the fouls essentially negate the turnovers he creates. With that in mind, I decided to take a more holistic look at things by creating “Charge Rate,” a simple stat that measures how efficiently a player draws charges. All it entails is dividing a player’s total of charges drawn by the total number of whistled collisions he’s been involved in; a number we can generate by incorporating the blocking fouls he’s been called for. At the top of the list was Tolliver, who has been the NBA’s best player at drawing charges while not getting whistled for blocking. Over the past three seasons, Tolliver’s garnered 42 charges in 54 total collisions, a Charge Rate of 78 percent; easily the best mark among players who’ve taken at least 30 charges since the start of the 2014-15 season. For context, consider that the average NBA player this season has a Charge Rate of just 40 percent, according to the collision counts on BigDataBall, which logs play-by-play data. Leaguewide charge rate is 40 percent. Excludes players with fewer than 30 charges drawn the past three years. As of games played on March 14. A number of other players around the league have struggled in this area just as much as Tolliver has succeeded in it. Toronto Raptors center Jonas Valanciunas has drawn just one charge but has been called for 16 blocking fouls, a Charge Rate of 6 percent. Milwaukee Bucks All-Star Giannis Antetokounmpo has been almost just as bad, inducing one charge in 13 tries, for an 8 percent Charge Rate. Minnesota’s Cole Aldrich, Philadelphia’s Dario Saric, Toronto’s Lucas Nogueira and Brooklyn’s Joe Harris have combined to go 0-for-36 in drawing charges this season, highlighting just how tough it can be for some players to persuade officials to side with them in bang-bang scenarios. The other thing that helps? Tolliver says he doesn’t flail or flop. He argued that it’s not necessary to, because of the way he takes contact. Much of how Tolliver is programmed to think on defense stems from his time at Creighton, where then-Bluejays coach Dana Altman6 often preached the importance of drawing charges. Under Altman’s direction, Creighton ran frequent practice drills teaching players how to properly take charges. And because of the coach’s emphasis on drawing charges in practice, the program seemingly began paying more attention to the skill in games. Rob Anderson, the team’s longtime sports information director, said he began manually tracking the metric — which isn’t kept by the NCAA — along with a stat spotter in 2002. Of course none of this means that being skilled at taking charges is the same thing as being a good defender. Tolliver himself, merely a decent stopper, would be the first person to tell you that. And the fact that Sacramento — tied for the NBA’s fourth-worst defense — manages to get 4 points worse per 100 plays on D when Tolliver is playing illustrates that no amount of charge-taking would make the Kings good on that end of the floor. Still, there is an art to how he goes about taking charges — both to prompt refs to side with him, and to avoid getting seriously hurt during the collisions. The key, according to Tolliver, is to set your feet, then begin falling as soon as the driving player makes contact with you, and not a millisecond before. But any way you slice it, taking a charge is going to be uncomfortable, he said. The main objective, aside from winning the call, is to avoid a potentially serious injury. “You can get really hurt if you don’t know how to take one. Even if you do know how, it’s gonna hurt. It just doesn’t feel good,” he said, adding that teammates asked him if he was OK after taking a knee to the chest from Oklahoma City’s Steven Adams. “I told them, ‘Yeah: I know how to fall,’” he said. Whereas other players might not be good at taking charges, or simply may not want to, Tolliver feels as if he has no choice but to play to his strengths in hopes of finding a more permanent NBA home. So that means relying on his ability to draw fouls in a physically taxing way. But maybe now, with more statistical information at our disposal, Tolliver’s nearly flawless ability to draw charges will get the credit it deserves. Neil Paine assisted with research for this piece. Tolliver became the ninth player in league history to play for at least that many NBA teams during his first nine seasons, according to Basketball-Reference.com. The other eight? Ish Smith, Lou Amundson, Mike James, Drew Gooden, Kevin Ollie, Damon Jones, Tony Brown and Tony Massenburg. The charge, block and collision statistics for this story were last updated March 14. His ratios have been impressive in past years, too: In 2014-15, for instance, he drew 19 charges against just four blocking calls. Tolliver said he and Cousins — his former teammate in Sacramento — came into the season talking smack about which player would draw more charges this season. Cousins holds a pretty sizable advantage, even though Tolliver has won a greater percentage of calls in collision scenarios. All the numbers come from Anderson’s tracking.